Xetulul, Guatemala’s and Central America’s largest theme park has dressed up for Christmas. Irtra is a Guatemalan institution funded by private industries, corporations and employers; which grants its employees access to vacationing centers located throughout the country. The business of ridden used cars from the U.S.
There’s a big business in riding old used cars from the U.S.A. to Guatemala where they are fixed enough to be put on sale. I have no idea what’s the percentage of cars in circulation Guatemala that were brought down from the U.S. and Canada to lesser degree, but it has to be huge. Oftentimes, the ridden vehicles or carros rodados as we call then here, are sold right at the border or near border towns such as in this case where a fleet of trucks is put on sale on the side of the road near the Mexican border by town of Pijapita. As I have mentioned before on AntiguaDailyPhoto, Guatemalans recycles a lot of discarded stuff from the United Statians; I call it the Second Life. Stela 5 at Tak’alik Ab’aj in El Asintal, Retalhuleu by ANTONIOLEDERER. 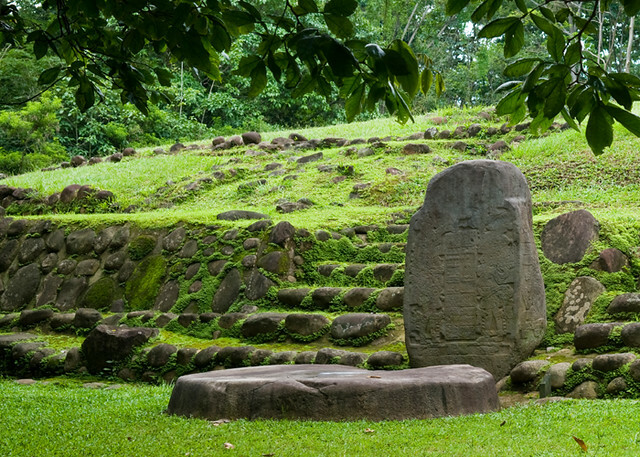 Tak’alik Ab’aj (/tɑːkəˈliːk əˈbɑː/) is a pre-Columbian archaeological site in Guatemala; it was formerly known as Abaj Takalik; its ancient name may have been Kooja. It is one of several Mesoamerican sites with both Olmec and Maya features. The site flourished in the Preclassic and Classic periods, from the 9th century BC through to at least the 10th century AD, and was an important centre of commerce, trading with Kaminaljuyu and Chocolá. Investigations have revealed that it is one of the largest sites with sculptured monuments on the Pacific coastal plain. Olmec-style sculptures include a possible colossal head, petroglyphs and others. The site has one of the greatest concentrations of Olmec-style sculpture outside of the Gulf of Mexico. Takalik Abaj is representative of the first blossoming of Maya culture that had occurred by about 400 BC. The site includes a Maya royal tomb and examples of Maya hieroglyphic inscriptions that are among the earliest from the Maya region. Excavation is continuing at the site; the monumental architecture and persistent tradition of sculpture in a variety of styles suggest the site was of some importance. Continue reading about Tak’alik Ab’aj at Wikipedia.